Being hydrated is essential for everyone. Our bodies need the correct amount of fluid in them for all of our cells to work properly. Breathing, cardiac, cognitive functioning, and digestion are a small example of the major items that need to work correctly for us to survive. This topic should certainly seem straight forward, drink water if you are thirsty, and then your good to go…..right? Throughout this article I want you to ask yourselves if you are staying as hydrated as you should be. I want to make sure all of you are doing everything you can to be ready and that includes staying hydrated. If you are on top of your health and fitness training you already know you have to be ready yesterday for whatever may present itself today, tomorrow or a month from now. Training for the fire ground is mandatory, you must challenge yourself for the unknown always and it must be done routinely. 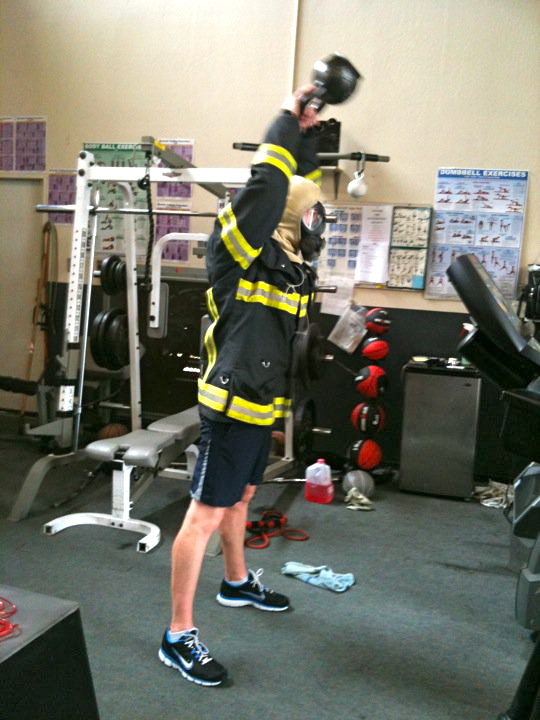 I like to train in full structure gear to allow my body to work with extra weight, learn to move with the restrictions of the gear, and learn to remain comfortable with the heat that is generated. Hydrating is critical to perform at the highest capacity and by the most efficient means possible while training or on an incident. When we are born our bodies are 90% water and by the time we are adults we are now in the 70% range. These numbers obviously can fluctuate depending on body mass, exertion levels, overall health, and the amount of water we consume. 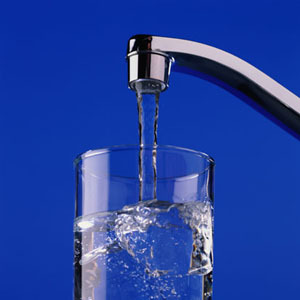 As adults we introduce food and liquid items into our diets daily that can cause us to become significantly dehydrated. Some of these items include, coffee, soda, energy drinks, salty foods and alcohol. I’m sure most of you reading this already train hard, you push yourself that extra mile during any physical training you may do, but how many of us hydrate properly? Being well hydrated will allow our bodies to function more efficiently while under stress and the likelihood of having to stop is greatly reduced. I know it seems simple enough, but hydration truly is a subject we should not overlook. Why is this so critical for firefighters who are expected to perform at the top of their game? Take any firehouse in the nation from Alaska to Florida, and their associated climate. During training, hazardous materials incidents, vehicle accidents or fires we are typically wearing structural firefighting gear. As we exert energy we create body heat, we then produce sweat which allows us to cool down. When these two things happen we are creating a very hot humid environment inside the turnouts. This cycle will continue until we stop or we start to suffer the consequences of fluid depletion. If we are not preparing yesterday for what can happen today, tomorrow, or next week, we are letting ourselves and our team down. A few years ago I did some very basic experiments during and immediately following my workouts. I was curious what my body temperatures would be when I was training in full gear? The climate in Northern California is predominately cool throughout the year, 60-75 degrees, very little humidity, and summers are a dry heat that range from the 80’s to high 90’s with occasional 100 degree days. 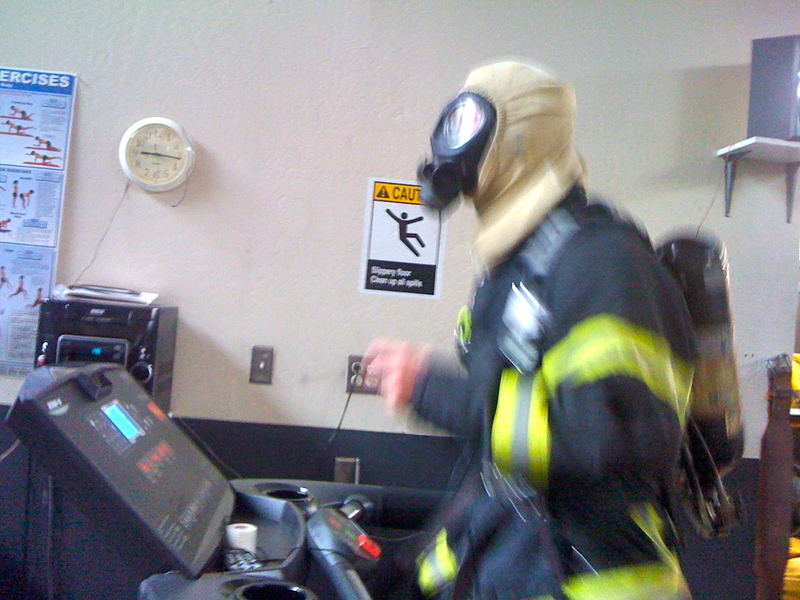 Twice a month I performed a standard workout that consisted of a run on the treadmill for 2 miles at 6.5 mph and a 2% incline in full structure gear with flash hood, and SCBA, no helmet. On my days off before returning to work I would hydrate myself with only water. 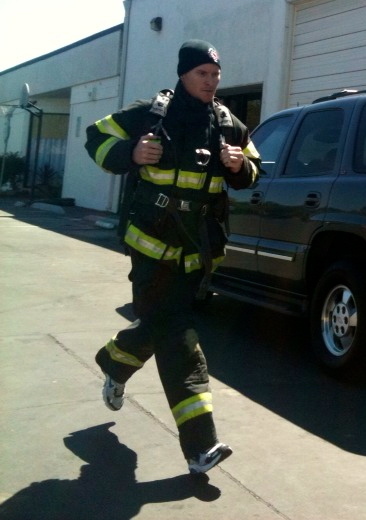 When I returned to shift I would run, as you can imagine my body produced significant heat throughout the training session. I had an electronic thermometer inside my jacket and I would have a fellow crew member take Thermal Imaging Camera readings of my body temperature. I was surprised to find that in the coldest of winter mornings or the hottest of the summer days, my skin temperature at the chest area was between 98-101 degrees. Before returning to work for the last shift of the month I would not drink as much water or stick to my same diet before the test. I was surprised to see the temperature readings increased by up to 5 degrees and I was slower in my times to complete the workout. I began having difficulties with things such as concentration, energy levels, sleep cycles, appetite, muscle spasms, and headaches, all signs of dehydration. When I repeated the same workout after hydrating myself sufficiently I didn’t have the issues I stated before, this cycle was consistent for a year. I have always prided myself in being as physically fit as possible and I constantly push myself to stay on top of my training. I follow a strict diet and very rarely deviate from it. Unfortunately the one thing I have never been consistent with or have followed was adequate fluid intake. Living in Northern California which has a fairly calm climate I never felt dehydrated or thought it would effect my performance, I was wrong! Staying hydrated is one of the most important things you can do to stay incident ready. It drives all of your functions and since completing this over a year ago I now follow a simple yet very effective formula when it comes to hydrating……pee clear! You will read different studies that discuss how much water you should consume on a daily basis, I like to follow my body weight in ounces at a minimum every day, 185 ounces. Fluid depletion is a major issue and one that should not be over looked by anyone, especially by members of fire departments that subject themselves to high heat and physical stressors. Dehydration can manifest itself in many ways and can affect people differently. During the summer months heat exhaustion and heat stroke are a major concern for anyone and this is functioning on the fire ground. The symptoms listed above that are associated with mild, moderate or severe dehydration can lead to heat exhaustion or stroke if not taken care of immediately. I want you to use this article as a mental check list. If you’ve ever wondered why recovery can take you longer after a fire, after a training event, or even why you may feel run down during your workouts, think about your fluid intake and realize it could be the easiest way to correct these issues and staying incident ready!